One college event that is always a highlight of my year is the annual scholarship luncheon. This is the event that recognizes recipients of scholarship funds given out by the NHCC Foundation Office, a charitable organization affiliated with the college. I have had international student advisees among the recipients for all the years I have worked at the college. In the 2012-13 scholarship cycle, five of my 70+ advisees were selected for awards. I was lucky enough to sit at a table with three of them at the luncheon when they were recognized for this achievement. After talking with this year's scholarship recipients, I gained a new appreciation for how much work actually goes into applying for this scholarship, or any scholarship. 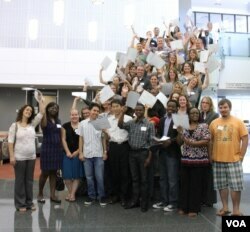 Many of the recipients had developed personalized strategies for successfully managing the scholarship application process. Here are six of the most important scholarship management strategies students have shared with me, as well as some of my own tips developed through working with students over many years. My hope is that this information, together with other advice that you receive on the topic, will help you maximize your chances of being selected as a scholarship recipient at whichever college or university you attend. Often a scholarship application will require you to submit an essay highlighting your past achievements. It will be easier to write this essay if you already have a collection of relevant content that can be woven into the essay. For this reason, I suggest that students start gathering relevant content in advance of the actual application submission cycle. Tip: Maintain a folder and add to it any documents that recognize your excellence and achievement in academic, extra-curricular and community-related activities. Scholarship applications, particularly those for larger amounts of funding, will likely require multiple components such as essays, letters of recommendation, and transcripts. For some of these documents, particularly recommendation letters, you will have to rely on others. By starting early and allowing yourself plenty of time, you – in turn – maximize the chance that others will be able to fulfill your request before the deadline. Planning ahead will provide you with a cushion that can be used to offset any unexpected, but often inevitable, delays. Tip: Work backwards from your deadline to construct a timeline for assembling your application. Consider using an electronic calendar platform – like Google Calendar or Apple’s iCal– to track your progress. Often these calendars can even email you reminders of the deadlines you’ve set for yourself. If you apply for enough scholarships, you will inevitably be required to write an autobiographical essay focused on your future educational goals and career path. In order reduce the burden of this exercise, I suggest trying to incorporate it – or something like it – into a writing assignment for a course at your current school. Tip: If you have an open-ended essay requirement for an English writing/composition course, talk with your teacher about writing an autobiographical piece that could serve as the framework for a future scholarship essay. Always leave yourself sufficient time before the submission deadline to revise your essays. Start on your own by correcting any errors in spelling and grammar. Then seek the assistance of a school staff member – such as a career counselor or librarian – who is willing to read over your essay for content. Some schools have writing tutors who can provide this kind of assistance. If you can’t identify a staff reader, select another student – ideally one who is a strong writer. Your work is not finished when you submit your application. You still need to create a personal archive of all your final application documents. You never know when a similar scholarship opportunity will be brought to your attention. Organizing your past application documents will help you get off to a running start for your next scholarship opportunity. Tip: Don’t rely solely on your hard drive to save your files. Archive your electronic documents in another location, such as a cloud-based service like Dropbox or Google Drive. I like to put the documents on a flash-drive that is stored in a safe place at home. In addition, if your submitted application documents were in .pdf format, make sure you’ve also saved the original, editable version. Denials happen. If there are several hundred applications for a single scholarship, then only one applicant will be pleased with the decision of the selection committee. If you get denied for a scholarship, try to regroup by examining what you could have done differently to strengthen your application documents. Do your best to use your current experience, though it might be filled with disappointment, as a teachable moment. Ask yourself, what can I do in the future to improve my chances for success? Tip: A few weeks after you find out you were not selected for a scholarship, take an hour or two to revisit your submitted application documents. First, reread the eligibility criteria and application guidance for the scholarship. Then look at your submitted application documents. The time you had away from them should provide you with the critical distance needed to see your documents with a fresh perspective.